MudBuster Bicycle Cleaner is a complex blend of bio-degradable liquid raw materials specifically formulated for the cleaning of all types of cycle. Our Bike Cleaner washes, removes extreme road grime and Dirt from your road cycle or mountain bike, all in one application, leaving it spotless. 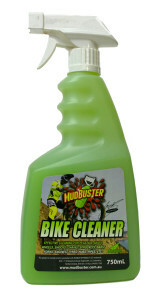 MudBuster Bike Cleaner is a natural based product and yet performs to the highest levels. It activates when mixed with air and water to eradicate even the toughest dirt & grime without damaging your Bike.